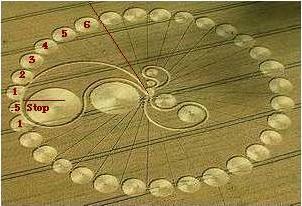 The 6 appearing in various crop circles represents different aspects of Planet X, coming together, as well as a time sense. 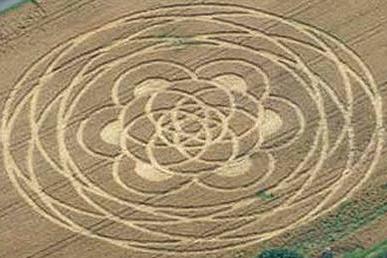 This has been a repeating theme of crop circles lately, so the point will not be missed. Nancy has lately noticed that a third persona has appeared, in the form of a red cross, in photos, very recently. As the planet gets closer, red light that scattered before and did not form into a persona of note is now dense enough to be noted. 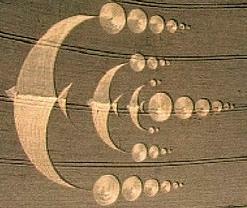 This will not be the only aspect of Planet X of note, and when listed will encompass 6 - the red dust in the tail, the moon swirls, the debris that becomes meteor showers, the red persona which carries the volume of light, the white persona which represents the physical placement of the corpus, and the newly emerging persona of the red cross. During the week of rotation stoppage, these aspects come together, which the August 3, 2003 Boroughbridge circle shows. Nancy has also noted that the July 20, 2003 Hackpen Hill circle has 6 circles after the small circle, and surmised this meant days of rotation stoppage after the 36 hour day when rotation rapidly slows to a stop. Here again the largest circles are related to visibility during that week, the increase in only days to that point. All this leaves to conjecture just when rotation stoppage will occur, which is by design. As we have stated repeatedly, to give a date would allow those who would murder hundred of millions of innocents advance notice and opportunity to implement their plans.